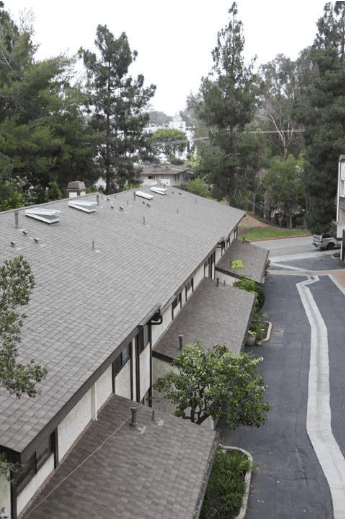 Chandler's Roofing has maintained, repaired and re-roofed home owners association condominium properties all across the Los Angeles and Orange County region since 1942. We have long-standing relationships with the communities and property managements companies in which we service. Throughout the years we have established a very professional and systematic approach to managing our clients roofing assets. 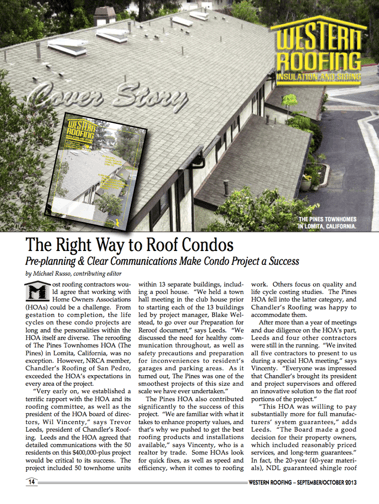 A roofing system, particular an Association’s roof, is an investment and thus should be managed accordingly. More often than not, a Property Management team has provided the HOA Board members with a long term evaluation and reserve study, which details the estimated cost of repairs and replacement down the road for the Association. The longer we can prevent unnecessary repairs and costs, the more reserves can be earmarked for other Association needs such as painting, landscaping, and other property upgrades. This is why Chandler’s Roofing takes a strategic, yet personal approach to every HOA and Property Management partner we deal with... No two HOA’s are the same, they all carry a unique set of requirements and needs. From start to finish you can expect a professional interaction with our company and the highest quality workmanship around. Though roofing is our core business, we are also experts in solar, rain gutters, insulation, skylights, roof ventilation, lumber replacement, and we have an in-house custom sheet metal shop for the trickiest of roofing repairs. 1- Roof Asset Evaluation: A complete evaluation and determination of the best short term and long term goal for the Management Company, the onsite Property Manager and the Home Owners Association. This evaluation can be for a single unit, an exclusive building, or the entire property. 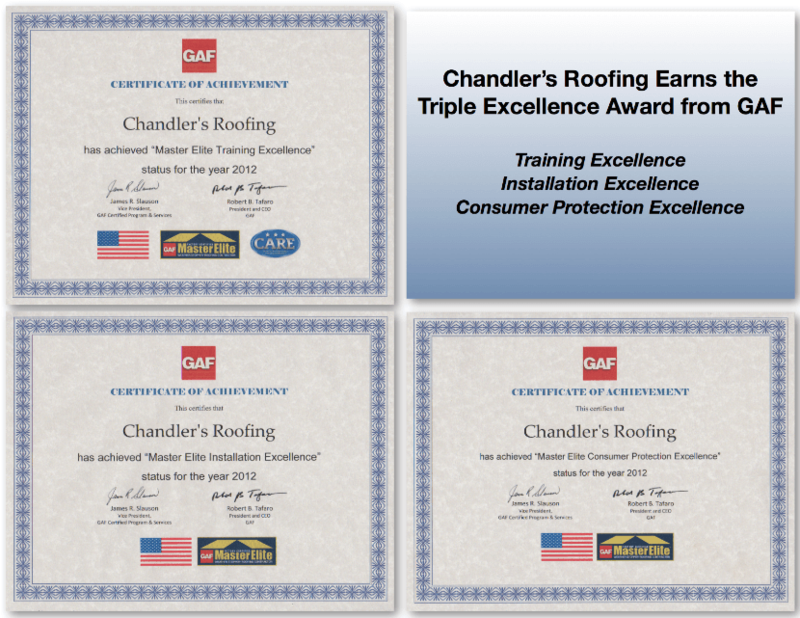 2- Roof Inspection: All roofs are inspected by a qualified and fully trained Chandler’s Roofing estimator, then reviewed by our in-house project management team. 3- Professional Roofing Estimate: Each proposal will include a thorough estimate and scope of work necessary to meet the Association’s short and long term needs. The scope of work could include, but is not limited to a roof tune-up, roof maintenance, roof repair, or complete re-roof of the property. All recommendations will be made with the genuine interest of maximizing the longevity of the existing roofing and rain gutter systems, while limiting the Association’s risk and longterm financial liabilities. 4- Project Documentation: All of our roofing work is thoroughly documented and photographed for management records and upon request a satellite roof measurement report can be produced to provide greater accuracy and detail for the roofing structures.  5- Preparation for Re-roofing: When Chandler’s Roofing is contracted to perform the work, we communicate clearly with management and will participate in any Association meetings necessary to plan for a safe and efficient project. Additionally, we provide a Preparation for Re-roof document which is to be provided to all residents prior to start of work. If necessary, we can attend meetings during the re-roof process as well to bring the Board and community up to date on any project in process. 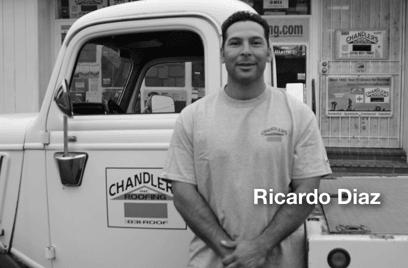 6- Roof Warranty: What sets Chandler’s Roofing apart from many other roofers in Southern California is the type of warranty we are able to offer our clients. Backed by some of the industries leading manufacturers, we are able to offer an Association project unprecedented roofing warranties which cover both the entire roofing system, as well as our workmanship. These warranties, known as No-Dollar-Limit (NDL) or extended manufacturer warranties provide extensive coverage to the HOA and limit your longterm liabilities and expenses. 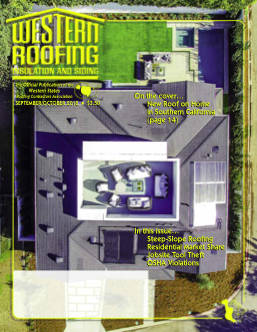 For example, on low-slope roofing systems, we are able to offer a 25 year NDL and on a case-by-case basis a 30 year NDL through our manufacturing partner, IB Roofing Systems, while on the steep-slope side we can offer an through the GAF Master Elite program a 40 year full roofing system warranty and 20 year labor and workmanship coverage. 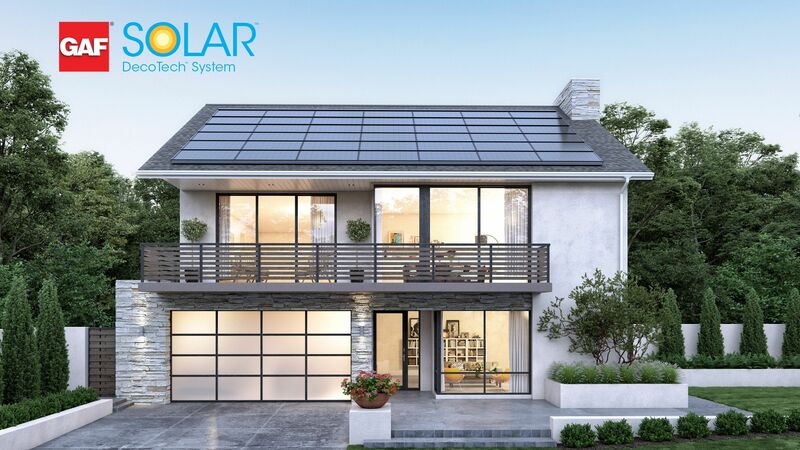 7- Roof Maintenance Program: After installation of a new roofing system, we don’t forget about you. Instead, we stay tied to your community and provide you with options to help you maintain your roofing asset long term. Most communities do not realize that almost every manufacturer requires some level of basic roof maintenance, even if it is simply clearing debris from the roof and gutters annually. When it comes to the roof and rain gutters in an Association the old saying truly applies here, “An ounce of prevention is worth a pound of cure!” Our detailed maintenance program provides your community’s roofs with a thorough inspection, removal of debris, resealing of all penetrations, clearing of rain gutters, full documentation and a set annual scheduling. We take great pride in our HOA and Property Management relationships and look forward to partnering with you on your next project. Please feel free to contact our office with any questions you might have and request a list of some of our most recent HOA projects for reference.